Note: This is an updated version of a post originally published in 2013. And that's why you've likely flocked to clothing stores like H&M and Old Navy, where the selection is expansive and astoundingly inexpensive. T-shirts for five bucks; jeans and dresses for under 20. It’s almost as though you can’t afford not to buy it. Americans, on average, now spend a significantly smaller portion of their incomes on clothing, yet have more expansive wardrobes than ever before. Buying a whole new wardrobe is almost cheaper than the cost of washing your old one (a bit of an exaggeration, but not all that far off). But those deals don't come without a catch. 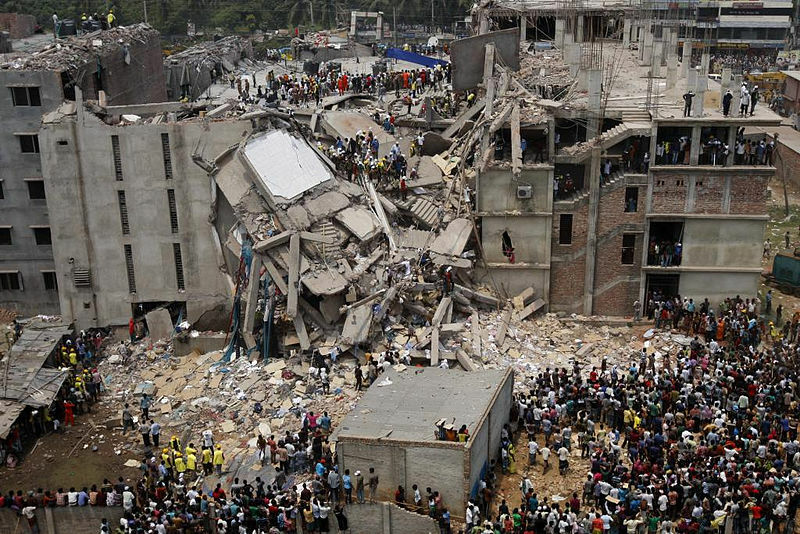 One consequence of cheap clothing received international attention in 2013, when an eight-story garment factory in Bangladesh collapsed, killing more than 1,100 workers who were manufacturing clothing for American and European retailers. Bangladeshi garment workers, the majority of them women, receive among the world’s lowest wages. At the time of the disaster, the minimum wage was roughly $38 per month. In November 2013, amid local labor unrest and international pressure, it was increased to $68 per month. Rana Plaza, the building near Dhaka that collapsed, was owned by a local politician who illegally built three additional floors onto the structure and installed heavy textile machinery. Even after large cracks were found in the walls the day before the disaster, factory supervisors – under pressure to fill orders - ignored warnings to vacate the building, and ordered workers to continue production. This was the deadliest industrial disaster in Bangladesh’s history, but certainly not the only one in recent memory. Just the year before, 112 garment workers were killed in a factory fire near Dhaka, when supervisors ignored fire alarms and prevented workers from leaving their sewing machines. Labor and production costs are dirt cheap. Making clothes in Bangladesh costs less than just about anywhere else in the world. Take a quick look at the tags on your clothing. There's a good chance at least some of them were made in Bangladesh. Since the 1990s, Bangladesh’s ready-made garment industry has exploded, and now generates close to $20 billion a year in exports. It's now one of the largest apparel exporters in the world, second only to China (which still far outpaces any other nation in exports, but has lost a good deal of contracts to Bangladesh, where production costs are even cheaper). Bangladesh is currently the third-largest apparel importer to the United States, after China and Vietnam. Meanwhile, employment in the U.S. apparel manufacturing industry has declined by more than 80 percent in the last two decades, from about 900,000 to 150,000 jobs, according to the Bureau of Labor Statistics. As recently as 1980, 70 percent of clothes sold in the United States were made domestically. Today, that's down to about 2 percent. Most large clothing brands used to have seasonal fashion lines that would remain on the shelves for at least few months. But go into an H&M store today and then go back again a week or two later, and you’ll likely find a completely changed inventory. This is the concept behind fast fashion, pioneered over the last 15 years by European brands like H&M and Zana, and to a lesser extent, The Gap, Benetton, Urban Outfitters and Forever 21. The idea is to capture the latest design trends and whisk them from the catwalk to the store, producing trendy but generally low-quality garments in the fastest, most cost-effective way possible. In an interview with NPR, Elizabeth Cline, author of Overdressed: The Shockingly High Price of Fast Fashion, explained that stores like H&M produce hundreds of millions of garments per year. "They put a small markup on the clothes and earn their profit out of selling an ocean of clothing," she says. H&M has about 2,800 stores in 48 markets and it's growing fast, especially in China and the United States. But with companies making billions and consumers getting great deals, the cost has to be absorbed somewhere. And that’s where cheap factories in developing countries like Bangladesh come into the fray, often to the detriment of workers and the environment. There’s no simple answer. It’s easy to blame the big clothing companies, many of whom reap enormous profits, fully aware of the decrepit conditions where their products are made. After the huge factory fire last November, a number of major clothing brands and retailers rejected a union-sponsored proposal to improve safety throughout Bangladesh's garment industry, the Associated Press reported. Instead, companies expanded a patchwork system of private audits and training, which labor groups allege do little and lack any real enforcement mechanism. The textile factories are almost all locally owned and managed, allowing Western retailers to maintain a distance from them and turn a blind eye to factory-floor conditions. And blame, of course, can also be directed at the factory owners and Bangladeshi government officials who knowingly exploit and endanger the workforce. In the wake of the Rana Plaza disaster, a growing number of major designers, including H&M, Zana and Benetton, signed on to a legally binding agreement to pay for major safety improvements. And since then, fire and safety assessments have been conducted in several thousand Bangladeshi factories where their clothing is made. But only a small group of American companies signed on. The Gap, Wal-Mart, Sears and Target are among the major American clothing retailers that balked at joining the accord, despite relying heavily on Bangladeshi suppliers. Some companies counter that they have their own safety improvement measures in place, while others, like Disney, have announced that they will leave Bangladesh altogether. Western companies are often quick to argue that although wages and working conditions in Bangladesh are far from ideal, they’re a lot better than they would be if the garment industry wasn’t there at all. Western demand has created jobs and training for millions of people, particularly women, offering a greater degree of independence and economic security. Since the arrival of textile manufacturing in the late 1970s, Bangladesh’s poverty rate has fallen from about 70 percent to less than 40 percent. And even though about half the country still lives on less than a dollar a day, income has risen markedly for large swaths of the population. Health and education have improved incrementally as well. And then there’s us. Consumers in Western nations now buy more clothes than ever before, according to Cline, particularly cheap clothes that aren’t made to last. Factory conditions would likely improve if consumers were to demand it, especially if we were willing to pay more for our clothes and absorb some of the costs . But that's easier said than done. It’s one thing to be horrified by Bangladesh’s recent tragedy and to hope conditions improve. It’s quite another thing, though, to choose to pay more for clothes that were ethically manufactured. With the exception of the worst tragedies that grab our attention, most of the inequities in this system are out of sight, out of mind. Which makes it all too easy to pretend they don’t exist. Which begs the question: How much more would you be willing to pay to know your clothes were being produced in an ethical manner? NPR's Planet Money show is documenting how T-shirts around the world are made.